Trends Audio BA-10: real hi-fi, only smaller | What Hi-Fi? It was a fairly odd experience – carrying a complete biamplification system out of the office to the car under one arm, especially when that system comprises a preamplifier and a pair of stereo power amps, as does the Trends Audio BA-10. The old joke use to go that you could always spot a hi-fi reviewer by the car: usually a rather larger estate than might seem appropriate, bought on the rule that 'If you can't fit a pair of serious floor standers in the back, move on'. In the days when I used the take a lot more equipment home for testing, I often found myself with the car loaded up to the roof with boxes, and down on the rear springs with the sheer weight back there. At one point I even seriously considered a van. Anyway, back to the Trends Audio BA-10 system: it's a complete biamplification system in miniature, from the Hong Kong-based company behind devices such as the PA-10.1D tube hybrid headphone amplifier, a tiny device with a single valve poking through its top panel. I've tried a few of the company's products in the past, so when I got an e-mailshot recently for the BA-10 system, I replied suggesting a review might be in order. After all, this is a true desktop audio system, combining the PA-10.1D – which also doubles as a single-source preamp – with a pair of the company's Trends TA-10.2P SE stereo power amplifiers. The power amps are just one example of a vast number of miniature amplifiers coming out of China using the Class-T Tripath TA2024 'amp on a chip' technology. 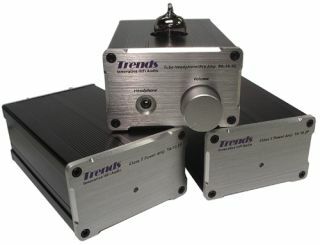 Trends makes three variations on this design: the TA-10.2 is a single-input integrated amplifier complete with volume control; the TA-10.2P is the standard power amp, complete with the same 3A offboard power used for the integrated; and the TA-10.2P SE version used here is the same amp, but with a larger 4A supply. And they really are minute: the power amps are dwarfed by their power supplies, standing just 33mm tall, a little under 5cm wide and just less than 12cm front to back, while the preamp is 4.6cm tall, 7.6cm wide and 14.5cm deep including sockets and volume control. There's a certain comedy value in setting this system up on your desk, helped no end if you can park all the power supplies away out of sight. Even better, you could hide the power amps away behind your speakers, and then you'd be left with just one tiny box, complete with glowing valve, apparently driving your speakers. Ah yes, speakers: well, with around 10W of usable power available from each channel of the power amps, you're not going to be using these amps with juice-hungry speakers, or indeed expect them to fill huge rooms with sound. True, they'll turn out a heady 15W into a 4ohm load if you push them hard, but that's at the expense of 10% distortion and noise; come down to a more acceptable 0.1% THD and you'll get 11W into 4 ohms, or 6W into 8ohm loads, while the amps can do 9W into 4ohms with just 0.03% THD. In other words, we're talking relatively easygoing speakers and fairly close-up listening – just the thing for desktop audio, in other words. The Trends Audio BA-10, like all the company's other products, ships direct from Hong Kong, though the company does now have a distributor in the UK, HiFi Cinema. By the way, it's worth noting that, since I received the sample, the company has launched the Trends Audio CQ-107 RCA Splitter Cable, a 0.5m cable pair with two phonos on one end, and four on the other, to make setting up biamp systems like this much simpler. Like the company's other cable products its uses Japanese-made audiophile interconnect and Trends Audio's own plugs, and is hand-assembled by the company. Also on the way from Trends Audio is a dual power supply, able to deliver juice to two TA-10.2P power amps from a single box rather than requiring separate power supply units for each, as is currently the case. It'll be available from the end of this month. As well as the system, Trends Audio also sent its biwire speaker pack, which adds $258 to the package and includes 2.5m of cable: I'd probably source something locally, especially in a desktop set-up, where about a metre or so of cable is going to be more than adequate. The PA-10.1D amp is also available with a range of valves: the standard version uses a Chinese 6N11 tube, the SE as supplied a Russian 6H23n, and there's also a GE version using an American-made 12AU7 valve. But you could always upgrade the valve later if you wished: other variants of the same valve can be found for under £10 for those who like 'tube rolling'. There's a single set of line inputs, with a rear-panel switch to select between CD player input and a feed from an iPod or similar device, with 3x gain on the former, and 6x on the latter. Add 3.5mm stereo headphone socket on the front, and two sets of RCA phono outs to the rear, and that's it. The power amps are similarly simple, with just a pair of inputs, and a pair of speaker outs, but despite the tiny dimensions the outputs are on high-quality banana/bare wire/spade combination terminals. As with the preamp, the power switch is to the rear, making this is system best left on. Trends provides instructions on the choice of biamplification options: you can either use one power amp for each biwirable speaker, with one channel driving the treble and the other the bass – the easiest way to do it if you're going to locate one amp beside or behind each speaker – or connect up the two amps so one drives the bass units in both speakers, and the other the treble. In other words, vertical or horizontal biamping. And the little system works superbly: I tried it (for a forthcoming Gramophone review) with both a pair of Q Acoustics Q2010i, with which it worked extremely well, and some original PMC DB1s, with even more impressive results. Just to reiterate the point about the limitations of the system, I wouldn't choose this set-up as a means of filling a large room with rock or large-scale classical music at 'the neighbours are out' levels, since it will undeniably struggle. However, used as intended, with speakers on the desktop and listening up close, the Trends Audio BA-10 proves both capable of excellent control and detail, and playing as loud as most sane listeners could ever want without signs of distress. The headphone amplifier is also highly impressive, as I discovered with my trusty pair of B&W P3 headphones plugged in. But above all, the Trends system puts a smile on the face by doing so much from so little: it occupies a minimal amount of desktop real-estate, looks as cute as the cutest thing imaginable, and yet delivers from its ToyTown-sized components a sound that's anything but toy-like.